Washington Nationals right fielder Bryce Harper bats in the first inning against the Houston Astros during a spring training game at The Ballpark of the Palm Beaches. Buster Olney believes Washington Nationals slugger Bryce Harper will do one of two things when he hits free agency next offseason – either stay in D.C. or join an up-and-coming Phillies team – and the ESPN analyst is so certain he's right that he's willing to pay a steep price if proven wrong. How steep? Let’s just say Olney is willing to “bet the family farm” – and that’s not a figure of speech. On Tuesday night's "Baseball Tonight" podcast, the baseball analyst answered a question from a Twitter user about Harper's future and whether the star right fielder can score a $400 million payday with his next contract after his current deal expires at the end of the 2018 season. 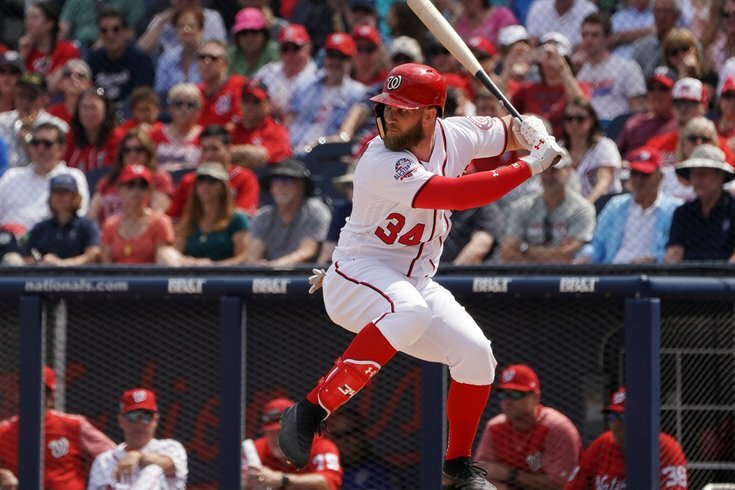 "I would bet the family farm that Bryce Harper winds up with the Phillies or back with the Washington Nationals," Olney declared, referring to the Vermont dairy farm where he grew up. Before dropping that line, Olney elaborated on Harper's chances at landing a deal in the neighborhood of $400 or $500 million following an arduous 2017-18 offseason that saw fewer teams willing to enter into long-term deals with veterans, freezing the free-agent market. "Just before I came up to tape this podcast, I bumped into Scott Boras who of course is the agent for [recent Phillies signee] Jake Arrieta – which is why he's here – and he's the agent for Bryce Harper. I didn't ask Scott this, but I guarantee you that what he would say is, 'Buster, teams pay for talent.' And Bryce Harper is a transcendent talent. I still think that he has a chance to push the deal to $400 million." It is worth noting that because of the league's declining prices for top talent, the Nationals' prospects of keeping Harper and other key players may be improving. However, the rebuilding Phillies have put themselves in position to cash in on a loaded free-agent class next year that could also include the likes of Manny Machado, Clayton Kershaw and Josh Donaldson. But whether Harper will be their man will likely remain up in the air for some time.